Franklin Delano Roosevelt spoke at the Inauguration of Chancellor Joseph M.M. Gray on March 4th, 1934. 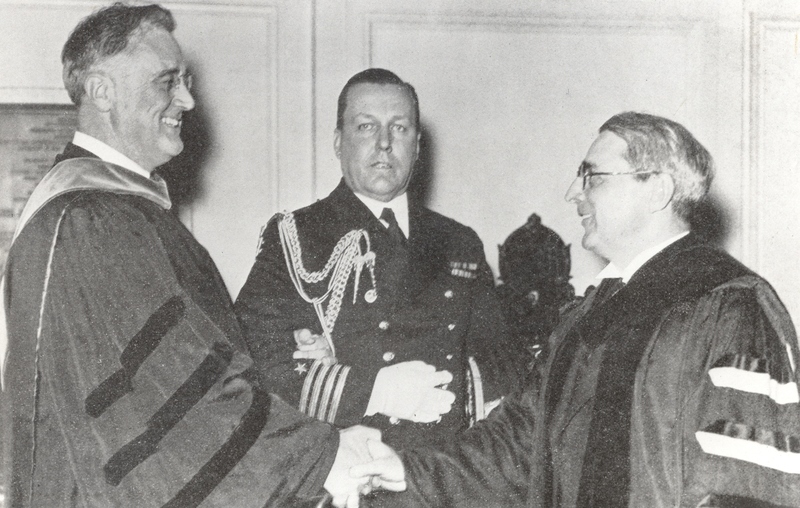 Franklin Delano Roosevelt maintained the intimate ties between national government and American University established by former U.S. presidents with his speech at the Inauguration of Chancellor Joseph M.M. Gray in 1934. Roosevelt acknowledged the future possibilities of American University for "initiative for constructive thinking, for practical idealism and for national service." He applauded the appointment of Gray as the new official leader of AU and endorsed the establishment of the School of Public Affairs, launched earlier that year.